Whether you are plumbing up a horse’s trough or fixing a hot tub, you’ll need the right PVC plumbing parts and glue to do the repair. PVC fittings for spa repair include elbows, tees, connectors, reducers and maybe some pipe or hose. Plumbing parts on a hot tub also include suction fittings, unions, manifolds, jets and valve parts. Finding the leak is the first step to ordering the right parts to fix it. In spas with removable cabinet panels, it may be pretty quick to identify where the water is coming from. In spas that are fully foamed, this task can be more daunting. So you found the leak and ordered all the parts you need from the Hot Tub Outpost. You may need to cut out the old plumbing parts with a hacksaw or cutting tool, then smooth the edges and try to put the new pieces together without glue to make sure everything fits first. Clean and prime the connections, then apply the PVC cement to both sections, give a quarter twist and hold for about 30 seconds until dry. If you glued it well, your horse should be able to drink from the trough again, or you can go back to enjoying your hot tub. Elbows can be regular slip connection elbows where the pipe or hose fits inside the elbow, or if it is a “street” elbow, one of the connections will be where the hose or pipe goes over the connector. Reducer bushings allow for the reduction of say 2 inch connections to 1 1/2″. There are reducer bushings all the way down to 1/2″. Manifolds come in various port configurations starting with a 2 port manifold. Common manifold types are 4-port, 8-port and 16 ports. 4s can be grouped to create a larger manifold as well. You may need plugs for any of the ports that do not need to go anywhere or for which there is not associated jet hose. Manifold plumbing allows for even distribution of water through several lines, commonly used to route water from the main pump hose line to the individual jets. There are water manifolds to route the water and air manifolds for systems that use an air blower. Valves help route the water or air and service valves may also be installed to help shut the water flow off around the pump or main spa pack/heater to allow for servicing of those components without the need to drain the spa. Unions are usually glued on one side and allow for a component such as the pump or heater to be connected to the plumbing without hard-gluing it. This allows that part to be removed and replaced without needing to glue in plumbing, but sometimes the unions themselves need to be replaced and that involves glue. PVC Glue: the best type is fast drying PVC glue such as by Weld-On. 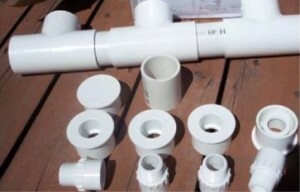 Get all your hot tub plumbing parts at www.HotTubOutpost.com.